Top-tier enthusiasts in all countries- from gamers, to power users, to system builders demand not only the best in heat dissipation and long term stability of DRAM, but they are increasingly looking for components that improve the overall appearance or attitude of their rigs. ADATA XPG V1.0 DRAM meets the demands of these groups, both technologically and aesthetically, and this improved heat sink is a strong step forward in this respect. With sleekly crafted lines reminiscent of the mechanical goliaths found on today's electronic battlefields, the XPG V1.0 DRAM comes in colors of red, black, and blue, grouped higher to lower according to the respective module frequencies. 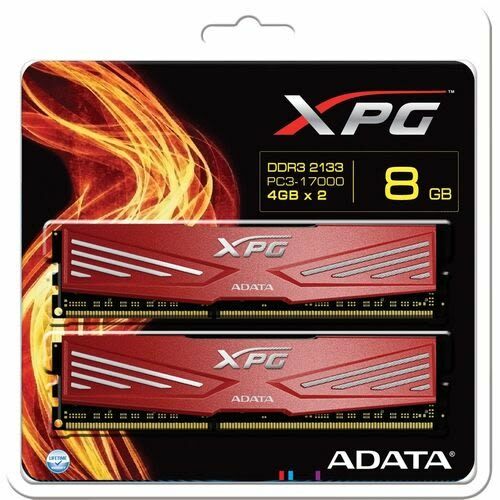 ADATA XPG V1.0 memory products are made in conformation with JEDEC regulations and DDR3-1333 standards at CL value of 9-9-9-24 . Each XPG V1.0 memory chip is selected through a strict filtering process, complete with high-quality PCBs (Printed Circuit Board) and an aluminum heat sink that effectively lowers module temperature, proven to reach a maximum speed of 2133MHz to make complete use of the computer's power. ADATA XPG V1.0 Desktop Memory uses 240-pin standard design. Operating at 2133MHz and 1.5~1.65 volts, its transfer bandwidth can reach 17,000 MB/s (PC3-17000), blazinGspeed you won't find elsewhere. In addition to ADATA's rigorous manufacturing process, we ensure the quality of each memory module. All ADATA memory modules come with a lifetime limited warranty. All ADATA memory chips are stringently tested. However, actual performance may vary due to a computer's motherboard, BIOS version, system configurations, operating system, system components, and other factors. Overclocking or changing the system clock may cause malfunction in some computer system components, and can even invalidate the computer's warranty. Please read the computer user guide carefully or consult the manufacturer for more information.